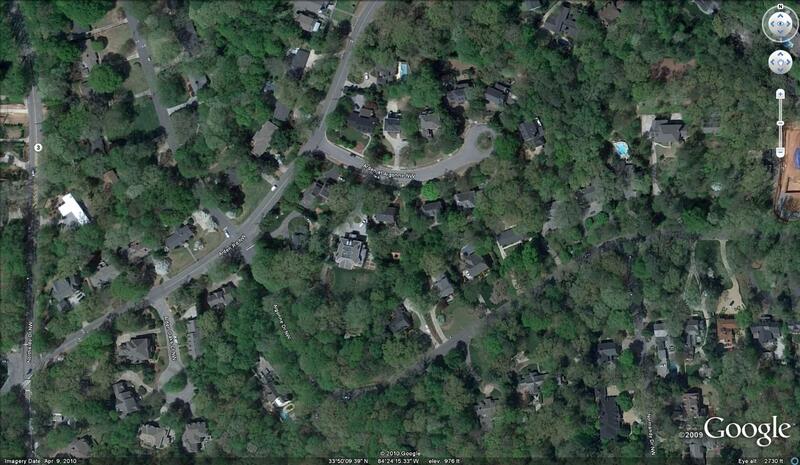 Google Earth view of vicinity of Spotswood Hall, at the center of this image. Built in 1913, Spotswood Hall was one of the first houses constructed as suburban development began to transform the countryside northwest of Atlanta in the early 1900s. 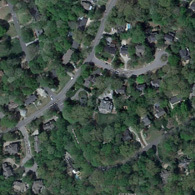 Formal subdivision began with Peachtree Heights Park in 1910 and Tuxedo Park in 1911, but adjacent landowners were simultaneously meeting the demand for prime building sites and larger “country estates.” The earliest of these estates were on Pace’s Ferry Road and included Mayor Robert F. Maddox’s Woodlawn, built in 1911 about a mile west of the old crossroads community of Buckhead, and James L. Dickey’s Arden, modeled after Washington’s Mt. Vernon, that was built that same year just across the road from Woodlawn. Soon Paces Ferry Road and the other roads, old and new, in the area were becoming fashionable addresses for Atlanta’s elite, and although the Maddox house was destroyed for construction of the present Governor’s Mansion in 1967, Arden, Villa Lamar, Spotswood Hall, and a few other great houses still survive from this first, pre-WWI phase of suburban residential development in northwest Atlanta. The house was built by Shelby Smith (1871–1943), Fulton County commissioner and a member of the building committee (1911–1912) that supervised contemporaneous construction of the new Fulton County Courthouse. A road contractor and real-estate developer, Smith built his new house on one of the most prominent sites in the developing suburbs northwest of Atlanta. In 1918, he sold the house to noted Georgia historian Lucian Lamar Knight (1868–1933), and moved to Druid Hills. Knight, who christened the house Spotswood Hall, had worked tirelessly for establishment of a state archives and was the first director of the Georgia Department of Archives and History when it was created by the legislature just a few months before he bought Spotswood Hall. His purchase of the old Shelby house represented the culmination of his professional career and social aspirations but his wealth evaporated with the stock market crash in 1929 and he sold the house the following year. The new owner, Walter Clay Hill (1880–1962), was a long-time executive, president, and chairman of the board of Retail Credit Company (now Equifax). He was also a major benefactor of the Atlanta Art Association, which established what is now the Woodruff Arts Center. The Walter C. Hill Jr. Auditorium there is named in his honor. Hill’s purchase of Spotswood Hall and subsequent remodeling by Shutze at the depths of the Great Depression created the house that exists today. Architecturally, Spotswood Hall represents the work of two important Atlanta architects, A. Ten Eyck Brown (1878–1940) and Philip Trammell Shutze (1890–1982). Brown is reputed to have designed the original Neo-Classical Revival house in 1913, around the same time that he was designing the Fulton County Courthouse. Featuring a two-story, pedimented portico, the house remains an outstanding wood-framed example of a style that was not often used in residential architecture. 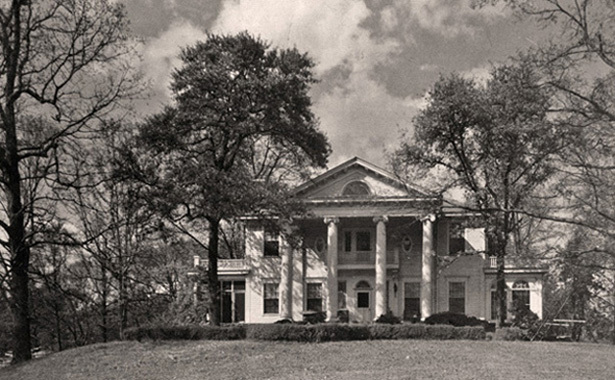 Philip Trammell Shutze (1890–1982), who had designed the Inman’s Swan House in 1927, redesigned the interior and rear of Spotswood Hall for the Hills in 1933 but preserved nearly all of Brown’s Neo-Classical Revival exterior. The dramatically redesigned interior, which includes a rotunda decorated by the renowned artist Athos Menoboni (1896–1990), echoes some of Shutze’s most important work from the 1920s, including the Swan House, while the redesigned rear facade represents the transition of his work to the Regency-inspired designs that characterized much of his best work in the later 1930s. The remodeling of Spotswood Hall was one of Hentz, Adler, and Shutze’s few commissions in 1933 and 1934, when the Depression forced the partners to forego their salaries in order to keep the firm afloat. It, therefore, represents not only an important phase of Shutze’s work but also a critical phase in the viability of one of the city’s most important architectural firms in the twentieth century. The history of the house presented here is a revision of nominations researched and written at the request of the owners at that time, Eric and Susan Friberg. With their support, the house was individually listed in the National Register of Historic Places in 2000; that same year, the City of Atlanta designated it a Landmark Building, giving it permanent protection under the City’s historic preservation zoning ordinance.